This jumbo leprechaun hat is the perfect way to top off your St. Patrick's Day costume. This St. Patrick's Day hat is nothing less than an over-sized hat for a leprechaun. The St. Patrick's Day hat is made of green felt and measures 8" wide x 10" tall. 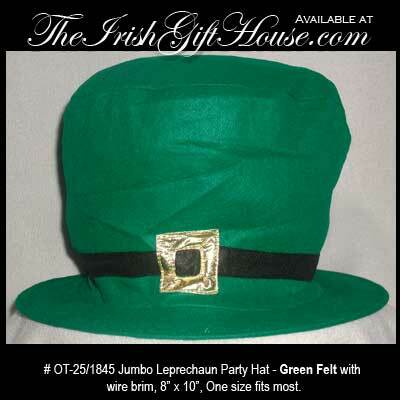 The Irish party hat features a wire brim and the one size fits most heads.